I think CNN must be hiring Amish kids on Rumspringa for its motorsports writers. That's really the only way you could explain the rich, lavish ignorance of how cars work as demonstrated in this article about turbo engines returning to F1. 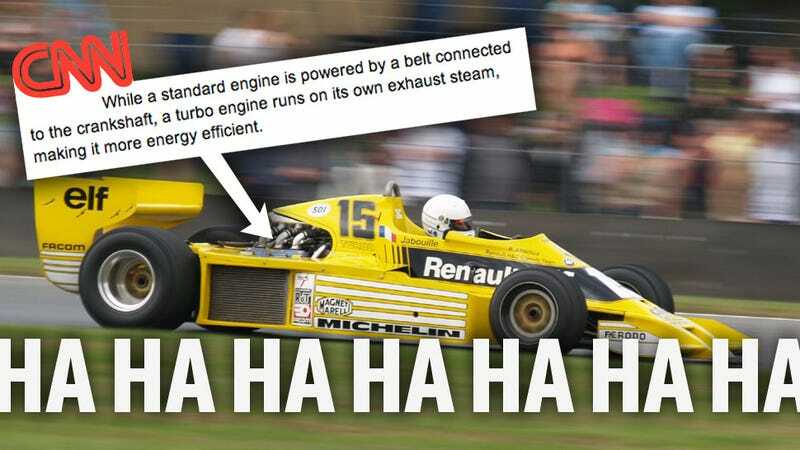 The basic facts are there — F1 regulations are calling for a return to turbocharged engines, which will be returning to F1 after 26 years, and that first Renault RS01 back in '77 certainly did have its share of teething issues, and would often dramatically blow its engine, like many of the other early turbocharged cars. Oh boy. Is it possible for one little sentence to get so much wrong, so efficiently? It's impressive, in its way. And, sure, it's CNN, not a dedicated automotive site, but in an article about F1 cars and racing tech, you'd think there'd be at least some attempt to get this right. It'd be like writing an article about an election that said "While a standard election is decided by court decisions from individual citizen legislatures, a runoff election leverages polling data from the most recent census." Sure, those are real words, but they make zero sense. Let's break it down: "a standard engine is powered by a belt connected to the crankshaft," is a great start if the goal is to establish that reality and physics have no place in this article. "Powered by?" what's driving that belt that drives the crank? Probably raw horsepower, contained in a pressurized vessel, extracted from the finest Arabian horses, liquified, and kept at 50 PSI. 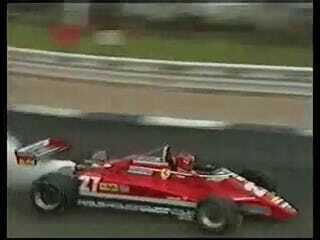 Of course, turbo engines are much more efficient, since they "run on their own exhaust steam." That would make them basically like, I don't know, perpetual motion locomotives? That is very efficient. This person clearly has no idea about how a car actually works. Sure, when one of those early turbos failed, coolant splashed around and hit hot engine bits and made all kinds of billowing steam clouds, but that is most certainly not "exhaust steam." There's no stoker crammed in the back of an F1 cockpit frantically shoveling coal into the boiler so the driver can perform a dramatic overtake on a turn. For the record "standard" engines — which must mean naturally aspirated here — work by mixing air and fuel, sucking it into a cylinder, compressing it with a piston, and then burning it, while turbocharged engines do the same thing, but use the escaping exhaust gases to drive a turbine to increase the pressure and density of the fuel air-mixture in the cylinder, which gives more power when then ignited. But once in full flight, they maintain speed well, and today you'll often find turbo engines used in trains, trucks and construction equipment. Really? My local diesel locomotive or bulldozer may be utilizing one of these remarkable exhaust-steam turbinators? Fascinating! I wonder if perhaps, one day, one of those fascinating devices may make its way to my personal motor-coach? No longer will F1 circuits roar with the sound of standard 2.4-liter V8 engines — referring to their eight cylinders. Instead, they'll be fitted with 1.6-liter V6 turbo-charged units, in line with the new F1 rules. Oh! THAT's what the 'V8' stands for! It's not the vegetable drink! Whew, that's a relief, since I can't imagine anyone chugging 2.4 liters of that stuff. Seriously, CNN, this is ridiculous. Next time, feel free to give us, or, for that matter, almost anyone else a call and we'll help you out with the tricky parts.